POLITICAL TIDBITS: Boracay as Paradise Lost---can it ever become Paradise Regained? Challenge for new PNP Chief Albayalde is to rehabilitate the 90% of drug addicts who, as police admitted to Cardinal Tagle, could still be rehabilitated. Boracay as Paradise Lost---can it ever become Paradise Regained? Challenge for new PNP Chief Albayalde is to rehabilitate the 90% of drug addicts who, as police admitted to Cardinal Tagle, could still be rehabilitated. In the latter half of 2017, then NCR Chief Oscar Albayalde addressed a gathering of foreign diplomats at the Manila Peninsula, to which I was invited by the consul of Estonia, Dr. Juan Peña. At that time the PNP under Chief Ronald “Bato” de la Rosa was under heavy fire for his command's summary executions of drug addicts by the hundreds. The heavy-set “Bato de la Rosa” lived up to his monicker and could have been easy recruit as character actor for the stereotyped executioner in vintage Shakespeare films. At that luncheon, PNP NCR Chief Albayalde, looking trim in his blue uniform and sounding more like a lawyer than a fire-breathing police officer---stressed the determination of the police organization to adhere to the law in carrying out its mandate vs. the drug menace. His foreign audience immediately liked his “clean” image and felt relaxed with him. “Okay ‘to,” said Consul Fernando Peña to me. 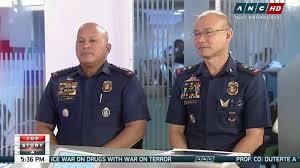 NCR Chief Albayalde is now in the PNP Chief's saddle and the citizens will keenly follow how he handles the drug problem---pitted against the controversial moves of his predecessor. Agbayalde told media a few days ago that he would cooperate with all investigations into the drug-killings, most notably those conducted by the Commission on Human Rights, as well as the Supreme Court order to the PNP to submit all case files on its Tokhang operations. What apparently won the President’s nod for Albayalde was his reputation for being “strict.” While NCR Chief he used to personally go around the metropolis nights by himself on a motorcycle and conduct surprise visits to PNP outposts. He would give hell to lawmen he found drinking or gambling at their posts. Albyalde's nocturnal visits to the NCR police is credited with the drop by nearly 18 percent of the crime rate in the metropolis during his watch. What’s interesting now is how he would balance force with reason in handling drug pushers, addicts and errant lawmen. In his Holy Saturday talk at the Tagaytay Highlands that I attended, Luis Cardinal Tagle of Manila stressed that lawmen have admitted to him that of all the drug addicts apprehended so far, only 10% are incorrigible while 90% can be rehabilitated. In the light of this revelation, it's interesting to see how new PNP Chief Albayalde would handle the 90% who could be returned to society as law-abiding citizens. Would the police force have the patience and the conscience now to stretch the humane arm of the law toward these 90% strayed souls who can still be saved? Another question, quite commonsense for new PNP Chief Albayalde from ordinary citizens: can he close the faucet of drugs, so that less Filipino youths would be victimized? Being caught and killed by the lawmen are the small drug couriers and pushers, but the big drug suppliers and smugglers are scot free. The release of two big and notorious drug suppliers recently caused such an uproar and rightly so---especially since the killing of small drug pushers and addicts continues. This lopsided leniency in favor of notorious drug smugglers over small drug users has to be explained to the public. At our dzRH Sunday program last April 08, Cecile Alvarez and I invited former UP Regent and Dean of Mass Communications Georgina Reyes Encanto, who spoke about how impressed she was during her recent visit to Japan. She praised the way ordinary Japanese carried on their day-to-day living efficiently and with discipline, as well as the order and cleanliness of Tokyo and environs. Cecile and I also agreed with Georgie Encanto’s observation about how the Japanese care for their environment and surroundings, and we concluded that such virtues ought to be instilled from the tender years, as is the case with the Japanese . Filipinos' less than admirable attitude toward the environment becomes more acute in view of the destruction of Boracay, the once-verdant crown jewel of our tourism program. No less than President Duterte recently called Boracay "a cesspool”---owing to the faulty sewage from various resorts that has been allowed to flow into the once clean emerald waters of the island, contaminating them. I have returned again and again to Boracay over the years, and I feel quite depressed about its sorry fate today. No less than the New York Times also has mourned its degradation. But the sad thing is that it isn’t just Boracay that has gone to seed. Reports from the Department of Environment and Natural Resources indicate that Puerto Galera, El Nido, the Ilocos beaches and other resorts around the country have also violated our environmental laws. The DENR and Tourism have apparently been sleeping on their job of making sure these resorts comply to restrictions. President Duterte's order to shut down Boracay for six months pending rehabilitation has resulted in mass lay-offs---a stiff price to pay, but it must be paid. Recall too how a huge fire resulting from the careless disposal by some campers of a portable butane stove recently resulted in the destruction of some 5.9 hectares of grassland and various rare species of ferns and bird-life in Mt. Pulag---the third highest mountain in the country, that borders Benguet, Ifugao and Nueva Vizcaya. Experts assert that it would take many years to rehabilitate that area of Mt. Pulag. Charges are going to be filed against seven mountaineers under the National Integrated Protected Areas System (NIPAS), as provided by PD. 705. Dapat lang. But more than that, our families, the schools and mass media have to engage in values formation, like the Japanese do---advocating that a crime against Mother Nature also should also constitute a crime against Humanity.